If you are looking for a cool Halloween science project that sounds gruesome but really isn't, then you should try making shrunken heads! 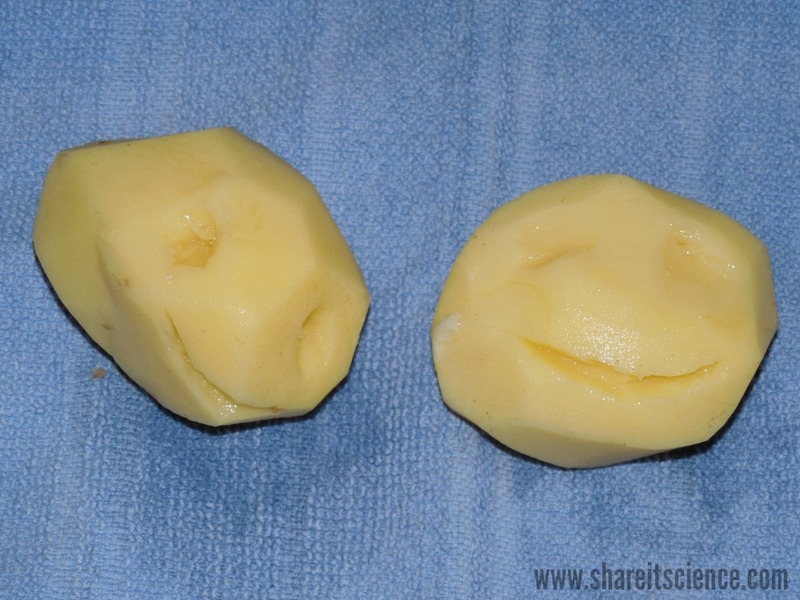 We experimented with making shrunken heads out of apples and potatoes. You may have seen dried apple heads used in fall decoration before, but have you ever made one? We wanted to know if you could make them out of something other than apples, and how the process worked. 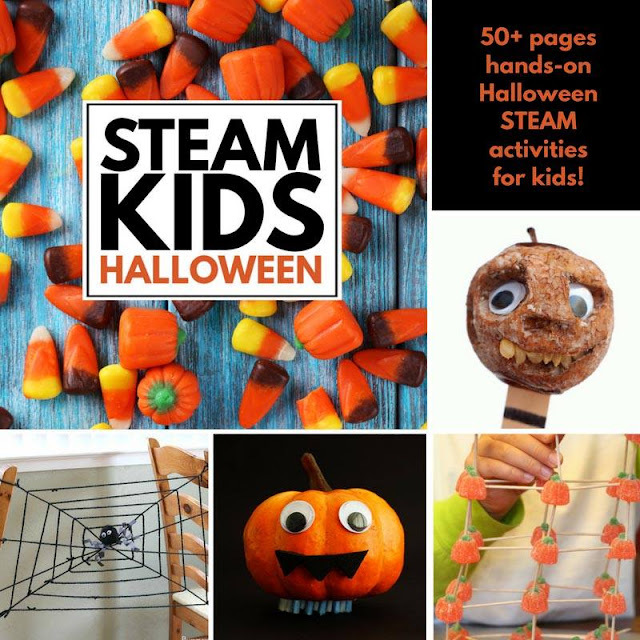 By designing, carving, preserving and drying out produce into these funny little Halloween decorations you can incorporate some art into a science investigation, adding some STEAM to your curriculum at home or school. This open-ended experiment is also a great way to allow your students or children to design their own investigation about food preservation, bacteria and enzymes! This post contains affiliate links, meaning I will be compensated if you make a purchase after clicking a product link. Please see disclosures for more details. First, we'll give you the directions we followed to make our shrunken heads. 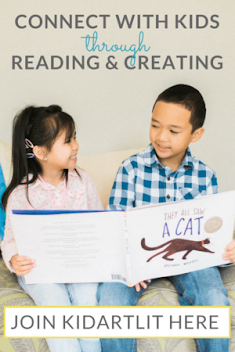 There are many ways you can complete this investigation, so read on to find out what worked and what didn't, further experiment extensions, and the science behind this project. First, we peeled the apples and potatoes. We found directions that said to core the apples from the bottom. We did this, but would like to try it next time without doing so. You'll see why below! Next, we made a solution of 1 cup lemon juice, and 2 Tablespoons salt. After the apples and potatoes were peeled, we popped them in the solution quickly to keep any browning from happening before they were carved. 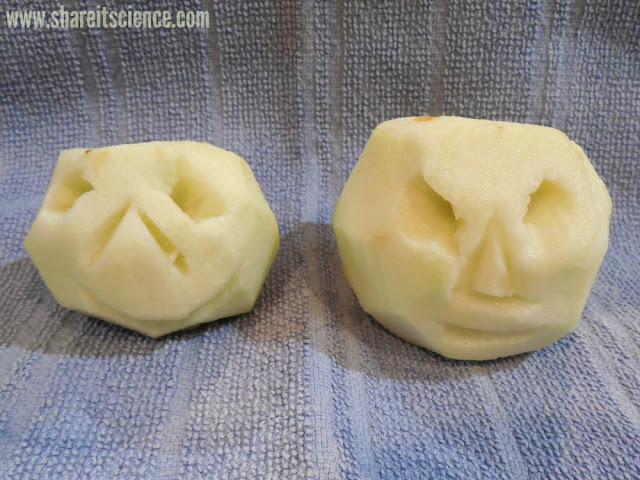 Then we carved faces into the apples and potatoes. Carving pumpkins is one of my favorite parts of Halloween, so designing these miniature versions was really fun! Once the apples and potatoes were carved, we soaked them one at a time in the lemon and salt solution for one minute on each side. Then set them on a towel and pat the excess liquid off. Next we needed to dry and shrink our apple and potato heads. The options are setting them in a warm dry place for a couple of weeks until they shrivel, or put them in the oven at low heat for a long time. We opted to dry them in the oven. 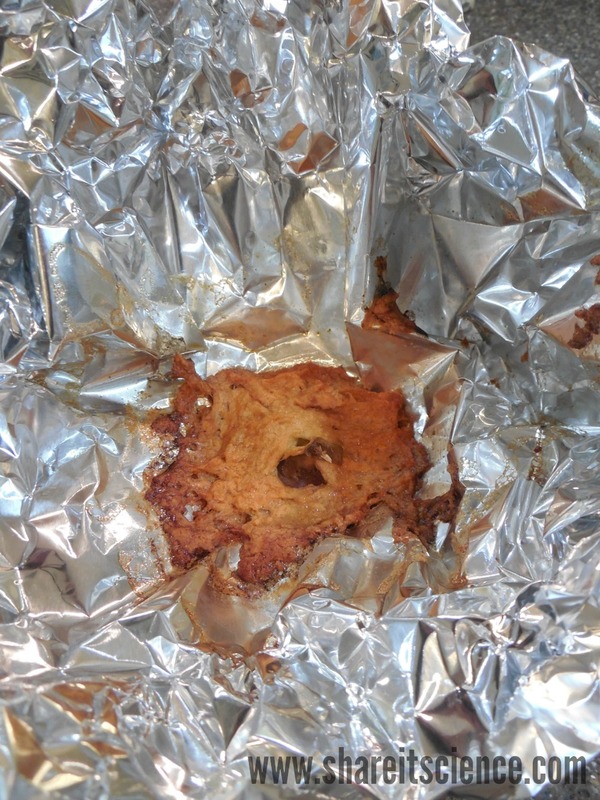 Against our better judgement, we took some online advice and loosely wrapped the apples and potatoes in aluminum foil, and put them in the oven at 200 degrees for several hours, checking every hour or so. The foil kept too much heat and moisture in, and one of our apples quickly turned into mush! It was a small apple, so this could also be another reason this happened. We kept the foil around the "heads" but opened it so that some of the moisture escaped. Our potatoes were unscathed, but the larger apple had a sunken look as the bottom got pretty squishy. This is also why next time we might try to do this without taking the apple cores out. There wasn't much support for the apple in the oven. We'd also like to try air dry them as well. We knew they were done once the apple was spongy and shriveled, and the potatoes had grown very hard. You can then decorate the shrunken heads any way you want! We added just a few little marker highlights to our potato heads. They came out pretty cute! You could add hair, hats, or even make some fun food sculptures with them! Drying fruit and vegetables is a method of food preservation that has been used for a long time. In this experiment, we helped to preserve the apples and potatoes with lemon juice and salt. There are many other food preservatives that you could try in an experiment like this. Can you design a different experiment using another preservative? 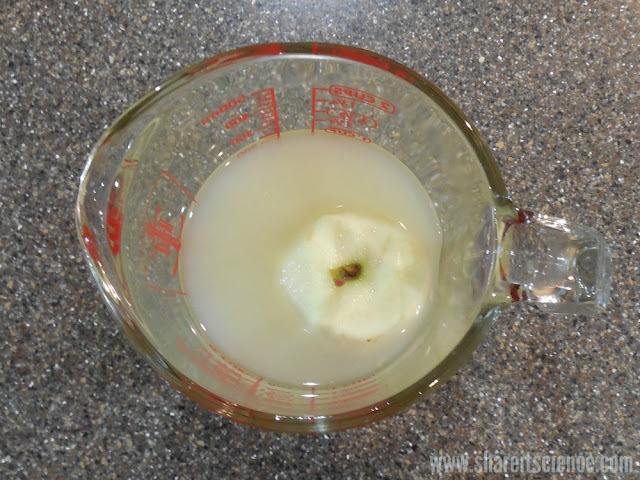 If you're looking for another great apple preservation experiment, check out this one we published featuring the Zoey and Sassafras book, Monsters and Mold. You probably already knew that lemon juice keeps apples from turning brown once they are sliced, but how does this work? Enzymes are released from the apple when you slice into it and break the apple's cells. The enzymes react with the oxygen in the air, and the apple begins to brown. It doesn't take long for bacteria to settle on exposed fruit and begin the decomposition process. Speaking of decomposition, you'll definitely want to try this Pumpkin Jack experiment with your Jack-o-lantern this year! Lemon juice is acidic and by adding it to the apple, you lower the pH of the apple. The acidity prevents the enzymes from reacting, and helps prevent bacteria from settling in. 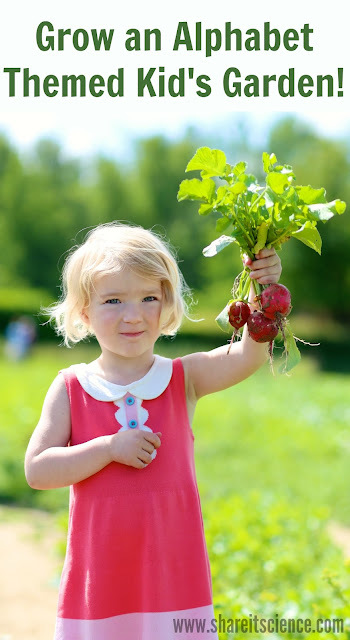 Salt helps preserve food because it lessens the water available in the food for microbes to grow in. 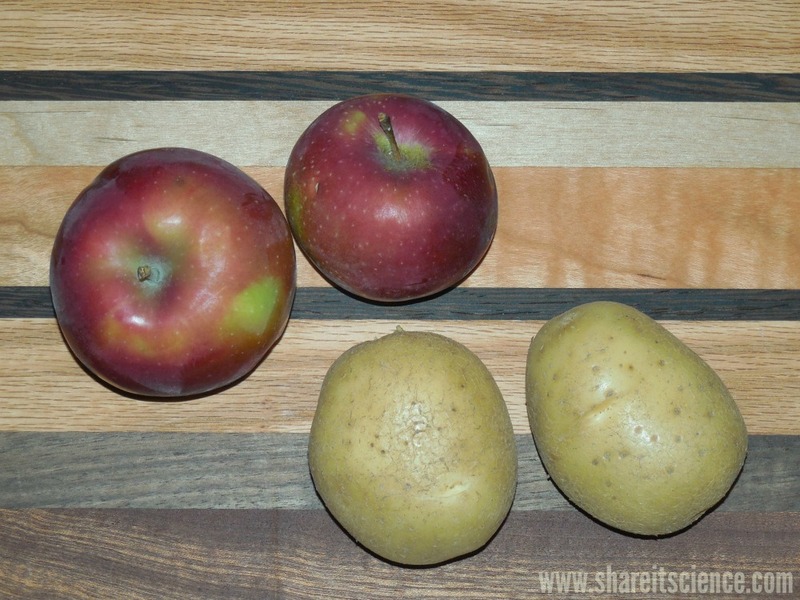 The combination of the two ingredients used in the experiment help to prevent the apples and potatoes from rotting and from remaining too wet. 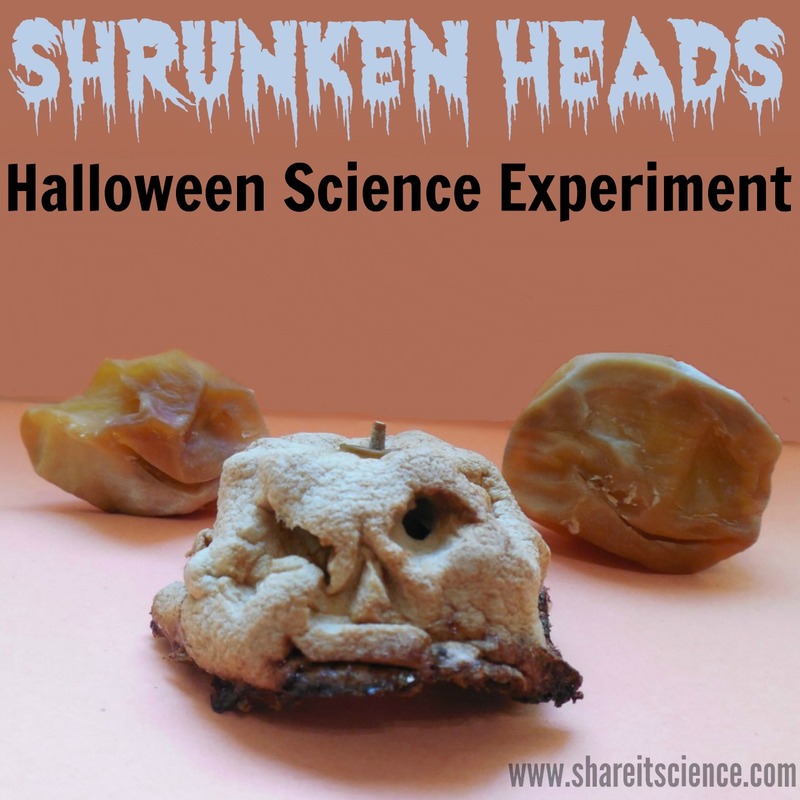 What other food preservatives, or types of fruit and vegetables could you carve to create shrunken heads? How would the experiment go differently if we hadn't cored the bottom of the apple? Would air drying the apples and potatoes resulted in a different effect? What other preservatives we try? What would happen if we left the apple and potato heads in a cup of salt for a few days? Could we dry the heads by sticking them in a cup full of rice for a few days? What other fruits and vegetables could you "shrink"? 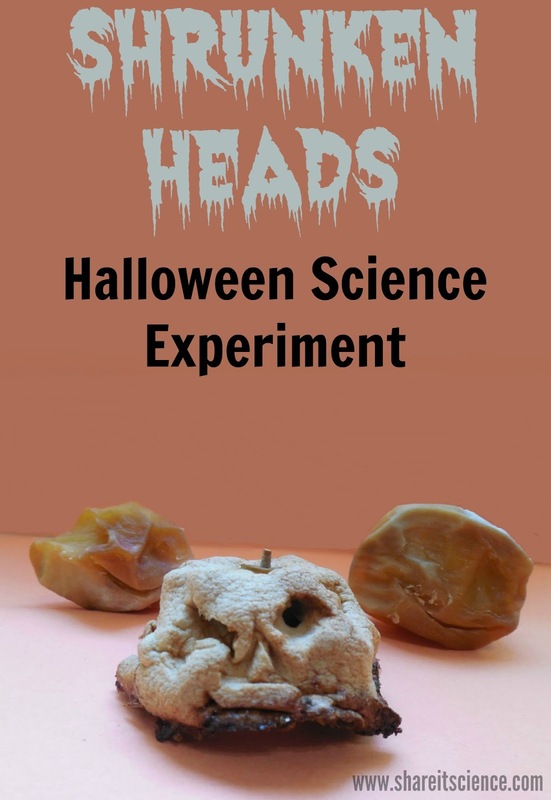 We'd also like to try decorating and making some cool Halloween art with our shrunken heads. The first Saturday of every month we like to get together with some of our blogger friends to share some awesome STEAM (science, technology, engineering, art and math) activities with you. This month they are all Halloween themed! You also will want to try this apple-themed fall STEM activity. Looking for more excellent Halloween STEAM activities? 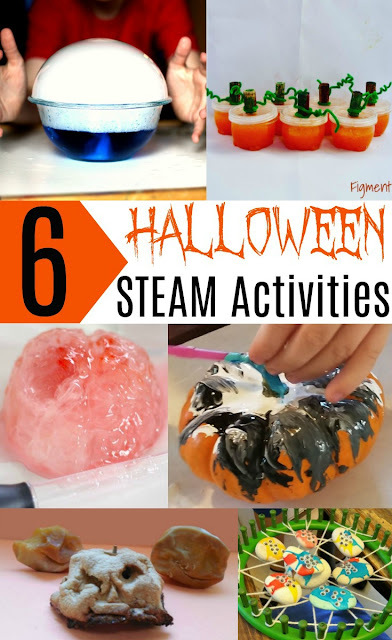 Click the image below to learn more about STEAM Kids Halloween.